While Bryan Adams might succeed in getting his fans to tell all, Nitin Paranjpe, Managing Director of Hindustan Unilever, decided to turn his company inside out with one aim - to get into the consumer's mind. So, in 2010, about two years after he took over the top job in April 2008, he made HUL accountants, production and human resources people go out and meet consumers in villages across India. Just as he did himself - and there was learning. At a village home in Tamil Nadu, Paranjpe found a sachet of Comfort fabric conditioner and thought something was amiss. "I was worried. I thought the poor lady must have mistaken it to be a shampoo sachet and bought this brand wanting to use it on her hair," says Paranjpe. "So, I asked her: what is this, what do you use it for? She looked at me as if I was a strange guy and said, 'For clothes'." The findings coming from elsewhere on the ground were as surprising, if not startling. Girls in an Uttar Pradesh village, about 100 km from Lucknow, knew the use of face wash. Gopal Vittal, the company's Executive Director for home and personal care, says he was pleasantly taken aback when he conversed with young schoolgirls in remote Bihar villages in English. This was Mission Bushfire at HUL in 2010. And, to get a feel of the company's recent success - five quarters of volume growth after nearly a decade it would rather forget - Business Today travelled to villages near Pune. The Bhegdewadi hamlet, 30 km from the industrial city of Pune, is perhaps as far removed from the plush, steel and glass HUL headquarters in Andheri, a Mumbai suburb, as can be. Village women frequent the modest home of Vandana Bhegde - a member of Project Shakti, an HUL programme of leveraging self-help groups to enhance hyperlocal distribution - to buy the company's products. One of the visitors, Renuka, wants to buy Dove soap, a product HUL positions as a premium, upmarket brand, and Domex floor cleaner. At a kirana store in the nearby Ghotawade bazaar, Knorr Soupy noodles sell out the fastest. All this is good news for a company coming out of a rough patch. HUL has spent the past decade struggling with incremental growth, and the stock has been mostly listless. (See Flatliner.) It had a good year in 2008, and then in 2009 it got caught in the vortex of a global slowdown. The darling of the bourses as well management students in the nineties had turned a pariah. This was a period when HUL lost out as it was not leading the sector, says Paranjpe. 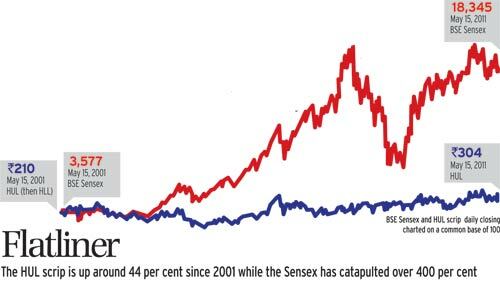 Kotak Institutional Equities's Manoj Menon, an analyst who spent the first four years of his career at HUL in corporate finance and then at a Himachal Pradesh factory, delves into basic economic theory to explain how HUL was overtaken by nimble rivals. "Historically, the company was too margin-focused. It kept losing market share and allowed companies like Godrej Consumer Products, Reckitt & Benckiser and Wipro to grab market share," he says. "With the loss of market share, HUL also lost some bargaining power." While Godrej No. 1 is the top selling soap by volume in northern states, Wipro's Santoor leads in the southern states. The Indian arm of Unilever, among the most aggressive global consumer companies when it comes to emerging markets, seems to have shed its margin obsession now. In fact, over the past five quarters, the company has successfully driven its volume sales up at the cost of profit margins, or the ratio of profit to revenues. Today, Hemant Bakshi, the company's Executive Director for sales and distribution, says the company will not cede any space to competition even if it means cutting prices and allowing a higher share of margin to retailers. With good reason. Harish Manwani, Chairman and also President for Asia, Africa and east and central Europe for Unilever, says the Anglo-Dutch parent wants 70 per cent of its revenues to come from emerging markets, against 53 per cent now. From 17 emerging market countries on its radar, India and Brazil are the two larger ones in focus for Unilever. How radical is the shift or change at HUL? Sample this: at Satara in Maharashtra and Mysore in Karnataka, HUL is doing a pilot with its Shakti self-help groups on financial inclusion. The Shakti group members can open an account in the State Bank of India "faster than they do at an SBI branch in Mumbai", says Bakshi. Shakti Amma, as female Shakti entrepreneurs are called, does this with a machine that uses biometric identification. Soon the company will use this to extend loans to its distributors. Elsewhere, Shakti members have become last mile payment collectors for cable operators or even caretakers for low-cost telecom towers. HUL has cast a wide net, fuelled by innovation (also see Eat Pray Love on page 82). All this adds to the importance of the Shakti Amma and adds to her income. Details of HUL's game plan will be unveiled as the pilots work out. At the product and logistics level, too, massive change is afoot. For instance, Wheel detergent, which contributes more than Rs 2,000 crore, or more than 12 per cent of HUL's Rs 19,000 crore sales, is now supplied from 20 supplier-owned factories across the country rather than being concentrated in particular zones. "This move to shift production to supplier-owned factories close to the market led to savings of Rs 1,000 to Rs 1,500 per tonne," says Vittal. And, not everyone knows that Wheel has two mixes for different parts of the country: hardwater mix for northern India and softwater mix for the south. In July 2010, Rin washing soap was infused with a patented technology for removing yellowness in clothes that comes with use. The result was a 30 per cent increase in sales, which crossed the Rs 1,000 crore mark in 2010/11. And, Rin is priced differently in southern and northern India as its "equity is different in the two parts", says Vittal. Adds Manwani: "We think local and act global, contrary to conventional wisdom. There is no global consumer, the consumer is always local." That is how the company dipped into its global portfolio, and Dove, a Rs 80-crore brand two years ago, has now become a Rs 650-crore play with face wash and shampoo categories added under the brand. The innovation story is more dramatic in distribution. "We are moving from a situation where distribution is seen as a supply job to saying how do we create consumer pull. It is a very important shift in mind-set," says Manwani. Last year HUL cut its number of distributors by around 20 per cent in large cities. In fact, from 10,000 distributors in 2002/03 it is now down to 2,400; Mumbai used to have 22, but now has only nine. "In rural areas the advantage might be going to more stores," says Paranjpe. "In urban areas going to more stores is not a competitive advantage, the quality of what they can execute in a store can be a source of competitive advantage." HUL also introduced a system of zero-inventory - in this, products arrive at its distributors' place from an HUL depot and stay there for just one night before being shipped to the retailers. Then there is the ambitious Project IQ. It is a part of HUL's "More stores, better stores" programme and uses technology to the hilt. "We've used technology to find out the buying behaviour and buying pattern of customers [here, customers are retail outlets] throughout the chain. Every single urban outlet to begin with. Exactly what a shopkeeper bought, at what frequency does he buy, etc. - we have captured it all over the last few years," says Paranjpe excitedly. Each urban sales agent at HUL - and it has an army of 12,000 employed by its distributors - now carries a Samsung Galaxy Tab. At every store he visits, the agent just has to key in its name and the tablet tells him what he has to do that day at that store. The tablet display shows in red which products are likely to run out of stock at the outlet and need to be replenished. It also tells him - the analytics and logic has been developed in-house by HUL - which other products are likely to sell at this outlet. At the end of the day, the salesman uploads data of what he has sold and downloads his schedule for the next day. After the salesman leaves, the shop is visited by the merchandising man. He, too, carries a tablet, which tells him how to arrange stuff on shelves - and once all sales and merchandising tasks are completed, a store becomes "perfect". With analytics, HUL gets a unique and powerful understanding of the market at a very granular level. "No human being can look at data from million and a half outlets and come up with the answers; the designed logic is to build an algorithm and come up with certain recommendations of the system," says Paranjpe. The next step is to build predictive intelligence into the software. While the "perfect" store will take time to realise, the immediate gain for HUL is that it has recorded volume growth across categories. Its profit after tax for the quarter ended March 31, 2011, after excluding exceptional items, showed a 22 per cent growth over the same quarter of 2010. The much smaller foods category that accounts for 20 per cent of its sales expanded 21 per cent. Ice cream sales, even before the summer set in, jumped 26 per cent. For the financial year 2010/11, the company showed a volume growth of 13 per cent and sales growth of 10.7 per cent. The last quarter showed an even stronger 14 per cent growth in volumes. At the same time, it saw a 2.9 percentage point contraction in its gross margin, reflecting increase in input prices and intense competition that resulted in price cuts and increased spending on advertising. The investing community has taken notice. Brokerage Kotak that had a "sell" recommendation for HUL until March has changed it to an "add". Says Kotak's Menon: "The company is signalling to its competition that it is not a pushover anymore and will fight for market share. It has launched new products in new niches, but unfortunately the competitive intensity is high and there is commodity inflation, too." Nomura India still continues with its "reduce exposure" recommendation. Angel Broking has an "accumulate" advisory on the stock and HDFC Securities says "buy on dips". The confusion among analysts reflects rising input costs, especially palm oil and crude prices. Rivals of HUL are sanguine, meanwhile. A. Mahendran, Managing Director of Godrej Consumer Products, says his company is yet to feel any impact of HUL's growing volumes drive or its willingness to battle competitors on retail margins. He says: "There is only one way - to build efficiencies in our systems and then transfer the benefits of that to brand building." Mahendran, a former Lever-ite, feels there is no point in worrying too much about the input costs, as they are cyclical and even out. Ajay Khanna, another former Lever-ite who led the company's agriexports business at one point and is now a consultant for start-ups in the consumer space, says the Indian marketplace has changed from the past when HUL was one of Unilever's most profitable units and regularly paid huge dividends to shareholders. "Today, there is a lot more competition for HUL, from deep-pocket competitors like ITC, Godrej and P&G. Other FMCG companies are focused on rural markets and finding other ways to penetrate deeper into those markets," he says. Also, some companies are willing to pay higher wholesale margins and incentives of up to 10 per cent for better penetration into smaller villages. To be sure, it is not just the HUL scrip alone that is languishing. Other FMCG stocks are not setting the markets on fire either. As if to underscore that it believes there is value in its Indian unit in which it owns 52 per cent, Unilever is buying back the HUL stock. HUL announced a share buyback programme in June 2010 and has just completed the process: it has mopped up 23 million shares or around one per cent of equity, for Rs 625 crore. It has also decided to hive off the export business as a separate subsidiary of the company and will focus on exporting Indian brands like Kissan and Fair & Lovely to the Indian Diaspora elsewhere in the world. India, in fact, today means a lot more to Unilever. Some 140 senior professionals who work for the London and Rotterdam-based parent in various parts of the world are Indians. There are products and models developed in India being shipped out, too. Pureit, the lowcost water-purifier, an innovation developed here is being launched in other emerging markets. Unilever is ready to take Project Shakti abroad: some parts of Africa will be the next testing ground for the grassroots distribution model. If that succeeds, the pains of the past decade that seeded the current powerful changes at HUL will be worth it.